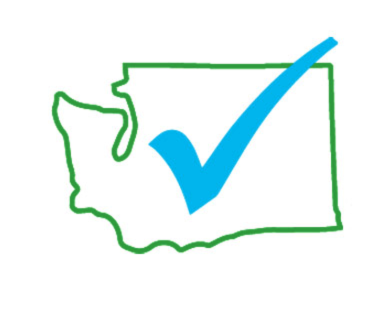 Per the WA DOH, in Washington State last flu season (2016/2017), there were 276 deaths associated with the flu. Two hundred and eleven laboratory-confirmed influenza deaths have been reported since week 40 of 2017, 143 influenza A, 62 influenza B, and 6 type unknown. Most deaths have occurred in people with underlying health conditions, or in people with no pre-existing conditions but who were elderly. One pediatric death has been reported. 10%. The vaccine is predicted this year to be just 10% effective against H3N2, the strain that appears will dominate this season. Is 10% better than nothing? No. The studies show otherwise. Continue reading. 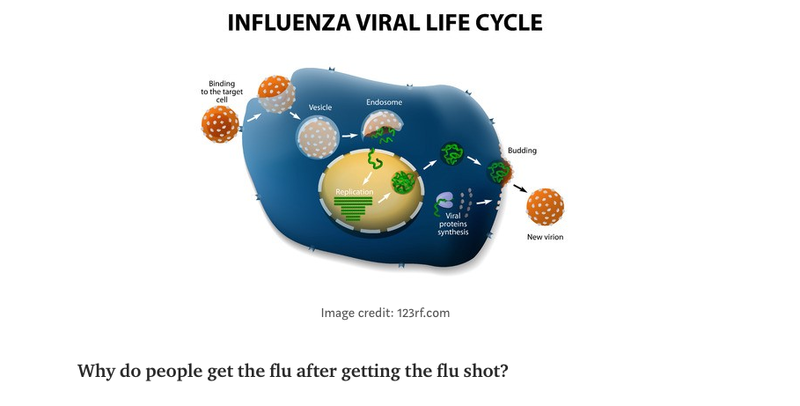 Does being vaccinated for the flu prevent you from spreading influenza virus? No. A study published in the Scandinavian Journal of Immunology in 2004 states: “The absence of immune response [to vaccination] in the nasal mucosa may indicate a lack of appropriate local influenza virus stimulation. An apparent drawback to traditional parenteral [i.e., intramuscular] vaccines is that they induce a weak and short-lived local mucosal immune response.” In other words, flu shots do not generate protective antibodies in the nasal mucosa, which harbors the flu virus upon infection along with the lower respiratory tract, where it causes more severe symptoms. So, even in case when the flu shot may protect you from the flu symptoms caused by vaccine-matching strains, you are still able to carry them in your nasal mucosa and spread them. Flu season hits Australia before the U.S., and can predict VE (Vaccine Effectiveness) here. The early numbers from Australia for the current 2017-2018 flu season was overall 33%, and ranged broadly depending on strain, and whether someone had gotten a flu vaccine the previous year (which dropped the effectiveness to 3%). For some strains in age 65+ groups the VE was in the negative numbers (meaning, it increased the risk of getting the flu). The full data can be found HERE. Warning: Multi-dose flu vaccines contain 25mcg of mercury. Single-dose flu vaccines contain “trace amounts” which can be up to 1mcg of mercury. Workplace and other Flu Clinics often use the multi-dose vaccines. An excellent explanation of why people get sick following flu vaccination can be found HERE. Please see our Vaccination During Pregnancy Page. “The available evidence is of poor quality and provides no guidance regarding the safety, efficacy or effectiveness of influenza vaccines for people aged 65 years or older. To resolve the uncertainty, an adequately powered publicly-funded randomised, placebo–controlled trial run over several seasons should be undertaken. “Conclusions. While LAIV vaccination is safe and effective at reducing IAV and coinfection with influenza virus and bacteria, LAIV may increase bacterial transmigration to the middle ear and could thus increase the risk of clinically relevant acute otitis media. These data warrant further investigations into interactions between live attenuated viruses and naturally colonizing bacterial pathogens. Repeated seasonal influenza vaccination among elderly in Europe: Effects on laboratory confirmed hospitalised influenza. “CONCLUSIONS: The four cRCTs underpinning policies of enforced HCW influenza vaccination attribute implausibly large reductions in patient risk to HCW vaccination, casting serious doubts on their validity. The impression that unvaccinated HCWs place their patients at great influenza peril is exaggerated. Instead, the HCW-attributable risk and vaccine-preventable fraction both remain unknown and the NNV to achieve patient benefit still requires better understanding. Although current scientific data are inadequate to support the ethical implementation of enforced HCW influenza vaccination, they do not refute approaches to support voluntary vaccination or other more broadly protective practices, such as staying home or masking when acutely ill. The long-term effects of febrile seizures on the hippocampal neuronal plasticity – clinical and experimental evidence. The CDC recommends TdaP and Flu vaccination during pregnancy based on perceived safety, not actual studies showing safety for the fetus either in the short term or for long term health outcomes. The FDA has not licensed any vaccine for use during pregnancy for protection of the fetus. All data currently gathered comes not from clinical trials but from the use of these vaccines in pregnant women in the general population. Pregnant women are not being told. Namely, pregnant women are not told that they are in essence taking part in clinical trials. They are shoddily run clinical trials since reporting pregnancy outcomes following vaccination is not required. The true impact of vaccination during pregnancy is not known. Tdap vaccine, for instance, contains 250 mcg of aluminum, a known neurotoxin, which can cross the placental barrier. “The real impact of biases could not be determined for about 70% of the included studies (e.g. insufficient reporting details, very different scores among the items evaluated). About 20% of the included studies (mainly cohorts) had a high risk of bias. Just under 10% had good methodological quality. Vaccination against human influenza A/H3N2 virus prevents the induction of heterosubtypic immunity against lethal infection with avian influenza A/H5N1 virus. Influenza vaccine effectiveness in the community and the household. Epidemiology of respiratory viral infections in children enrolled in a study of influenza vaccine effectiveness. Please visit the Vitamin D Council website for great information, including links to studies. VITAMIN D COUNCIL. Harvard Gazette Article: Study Confirms Vitamin D protects against colds and flu. Effects of a nutritional supplement on the immune response and cytokine production in free-living Chilean elderly. In Silico Analysis to Compare the Effectiveness of Assorted Drugs Prescribed for Swine flu in Diverse Medicine Systems. Effect of oral gavage treatment with ZnAL42 and other metallo-ion formulations on influenza A H5N1 and H1N1 virus infections in mice. Low pH gel intranasal sprays inactivate influenza viruses in vitro and protect ferrets against influenza infection. Sometimes science presents novel approaches to healing, and sometimes the opposite happens. When it comes to flu prevention, science has been confirming the wisdom of the past while revealing the shortcomings of modern approaches. Hippocrates said, “Let food be thy medicine and medicine be thy food.” This ancient wisdom is being confirmed by science as researchers continue to discover the complexities of the interactions between the food we eat, our gut biomes, our immune systems, neurological health, and even genetic expression. About 70 percent of the immune system is in the gut. The majority of immune and plasma cells are located there, and the health of those cells is determined by the diversity of microbiota (gut bacteria). When a flu virus is encountered, the innate immune system kicks in with an immediate response to rally the troops, and this gets the adaptive response activated. The beauty of this natural immune response is that it’s very comprehensive. A strong immune system can resist, or successfully fight and overcome, just about any strain of influenza that comes along. To resist and fight the flu, you need to feed your immune system properly. Diet fads come and go, but some basics remain constant. Fresh, whole, unprocessed, naturally grown and raised, fermented and cultured foods, are the building blocks of healthy cells as well as the preferred foods of your beneficial gut bacteria. These foods also contain the building blocks for glutathione, an antioxidant critical to the immune system. Most diet guidelines favor foods that alkalize the body, like whole fruits and vegetables, and limit acidifying foods, like meat, coffee, and simple sugars. Illness is often associated with acidosis, which negatively impacts immune response. For the average healthy person, consuming too many acidifying foods can lessen resistance to disease, but this can quickly be reversed by reducing or eliminating those foods. Sodium bicarbonate (baking soda) is the most alkalizing edible, which is why it’s a proven remedy for heartburn and acid indigestion when dissolved in water. While no studies have been done to show the effectiveness of treating influenza with baking soda, it’s a folk remedy that has biological plausibility, and many claim it halts or minimizes flu symptoms. A robust gut biome is essential even if you opt for the flu vaccine. Your immune system must properly respond to the injected antigen and other vaccine components, and an impaired immune system is associated with increased risk of adverse vaccine reaction. Even in the best conditions, the flu vaccine has not proved to be highly effective. According to the CDC, efficacy rates range over the past decade between 10 and 60 percent. The 2015-16 vaccine was estimated at 47 percent. For decades, researchers have been pondering the findings that those who get the shot each year tend to experience more cases of flu than those who only occasionally get the shot. One study showed an interval of five or more years between vaccinations was needed to maintain limited efficacy, but it’s not yet understood why this happens. One theory is that antibodies generated from the previous season’s vaccine hamper the response to the current one. With the influenza vaccine being the most reported to VAERS (Vaccine Adverse Event Reporting System), individuals must weigh the potential benefits against the known risks. Of recent note, cancer immunotherapy researchers announced in the ACS Medical Chemistry Letters their discovery that thimerosal, the mercury preservative used in the multidose flu vaccine, interrupts a key gene called ERAP1, which is linked to many health issues, including autoimmune diseases. It’s not yet known how this discovery will impact vaccines. If you do opt for the shot, ask for thimerosal-free. The health information in this article is provided by the columnist as an information resource only. Please consult your health care provider before making any healthcare decisions.